If you’re seeing small dark spots on your nose, cheeks, or chin, you might think you’re dealing with blackheads. But, if you’ve scoured the Internet for all things blackhead, you’ve likely also come across something called sebaceous filaments and wondered if that’s what you’re seeing—especially if the blackhead products you’ve tried haven’t worked. 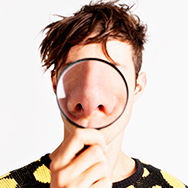 Blackheads and sebaceous filaments are easily confused because they typically appear in the same regions of the face. They can look similar, too, but they are indeed different. Look closely at the tip of your nose. Do you see small, pin-like dots on the surface of the pore? If the dots are quite dark, then you’re most likely looking at blackheads. If they have a clear flesh tone, or a gray or yellow tinge, what you’re likely seeing are sebaceous filaments. Another difference? Blackheads have a plug-like appearance when extracted, whereas sebaceous filaments more closely resemble a free-flowing column of wax-like sebum (resembling a tiny strand of hair) as they are squeezed out. Sebaceous filaments are naturally occurring hair-like formations that have a special job: They channel the flow of oil along the lining of the pores in which they reside. These filaments are a natural part of skin’s follicle (pore) structure, and everyone has them. However, if your skin is oily or if your pores are large and prone to becoming clogged, you’re more likely to notice them. A sebaceous filament becomes visible as the lining of your pore fills up with sebum (oil). A sebaceous filament may or may not turn into a blackhead—the determining factor is whether the sebum in the pore lining becomes exposed to oxygen (thereby oxidizing and becoming dark, changing into a blackhead). Truth be told, you can never completely get rid of sebaceous filaments. You can extract them, but they’ll come back shortly thereafter, usually around 30 days or less for those with very oily skin. They’re something everyone has, and most people won’t notice them anyway. Although sebaceous filaments are a natural part of skin, they can contribute to clogged and enlarged pores, and who wants that? Maintaining healthy looking skin is something we all should do, and regular use of a BHA (beta hydroxy acid) exfoliant can really help, because BHA is oil-soluble and can dissolve sebum and other substances crowding the pore lining. Use of a well-formulated clay mask might also help due to the clay’s oil-absorbing properties. And, of course, a good, gentle skincare routine based on your skin type is always a smart idea!